A one day rest following the conclusion of the Men’s Team and Women’s Team events; on Friday 7th September it is back to action at the 2018 ITTF-African Championships in Port Louis, Mauritius. The focus, as it has been during the opening three days of proceedings, is very much on Egypt and Nigeria; for the former the names in the spotlight are Ahmed Ali Saleh and Dina Meshref, for the latter Quadri Aruna, Segun Toriola and Olufunke Oshonaike. It is the Mixed Doubles semi-finals that start the day, an event that will be played to a conclusion later in the evening. At the semi-final stage, Ahmed Ali Saleh and Dina Meshref meet colleagues Khalid Assar and Yoursa Helmy; Segun Toriola and Olufunke Oshonaike oppose Mohamed El-Beiali and Farah Abdel-Aziz, also from Egypt. Notably Segun Toriola and Olufunke Oshonaike, as a pair, are the only previous winners of the event on duty in Port Louis; in 2002 they succeeded in Bizerte, a tournament in which they also won the respective Men’s Singles and Women’s Singles events. The success for Segun Toriola was his second African Championships Men’s Singles title; now he seeks his third and in the same city, two decades after he won his first; he won in 1998 in Port Louis. A third for Segun Toriola, for Olufunke Oshonaike, the defending champion, she searches for a fourth African Championships Women’s Singles crown, in addition to last year in Agadir and in 2002 in Bizerte; in 1992 she succeeded in Lagos. Should she succeed, she will become the most successful ever; at the moment, Olufunke Oshonaike is one of three players to have won the African Championships Women’s Singles title three times. Ghana’s Ethel Jacks won in 1964 in Accra, in 1968 in Lagos and in 1974 in Alexandria; Nigerian compatriot Bose Kaffo succeeded in 1990 in Casablanca, in 1994 in Cairo and in 1998 in Port Louis. However, for Olufunke Oshonaike, a tough test awaits; Cameroon’s Sarah Hanffou, the winner on home soil in 2010 in Yaoundé is also on duty as is Dina Meshref, the clear favourite to regain the title won in 2015 in Cairo. Notably on the third day of play in the final of Women’s Team event, Dina Meshref beat Olufunke Oshonaike in three straight games (13-11, 11-8, 11-6). 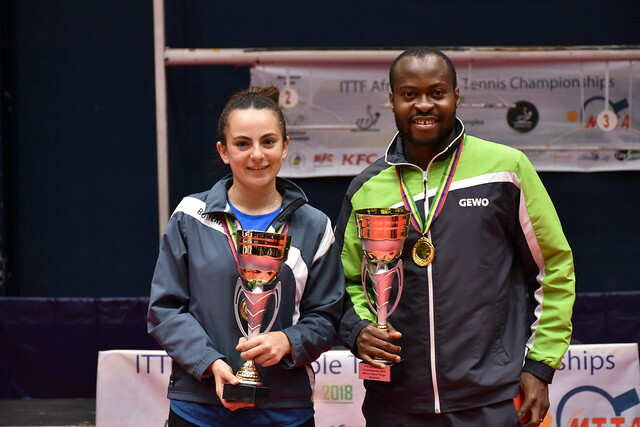 An unprecedented fourth for Olufunke Oshonaike, the goal is the same for Ahmed Ali Saleh, the only player to have won the Men’s Singles title at the African Championships on three occasions. He won in 2000 in Addis Ababa, in 2007 in Brazzaville and in 2010 in Yaoundé. In fact other than Segun Toriola, he is the only previous winner on duty in Port Louis. Meanwhile, for Quadri Aruna, the backbone of Nigeria’s success in the Men’s Team competition on the third day of play, when beating Ahmed Ali Saleh in the final (11-9, 9-11, 11-3, 9-11, 11-2), he seeks his first. In the Men’s Singles event Quadri Aruna and Ahmed Ali Saleh reserve the respective top two seeded positions, in the counterpart Women’s Singles event those places are reserved by Dina Meshref and Olufunke Oshonaike.